FFWPU NER: UPF of Latvia and UPF of Russia North-West region held a joint program aimed at fostering better relations between the two countries. The event related to the UN International Day of Peace took place at the Riga Peace Embassy, on September 27, 2014. Historically in Baltic countries, there are many Russian- speaking people. Now when relations between Russia and Ukraine have become worse, we are working in the direction of improving mutual understand and uniting the people centering on God. The NER members have already completed six conditions of prayers and bows for the sake of unity between Russia and Ukraine centering on God. The local Ambassadors attended the meeting for Peace. 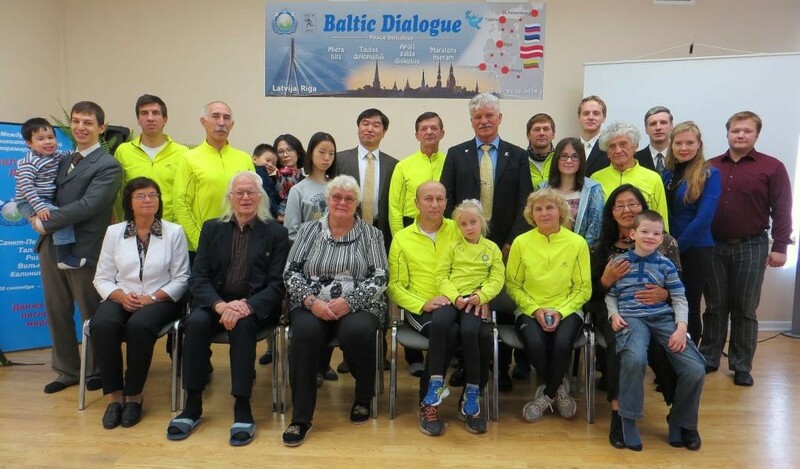 There were also runners of the International Marathon for Peace “St.- Petersburg – Tallinn – Riga-Vilnius-Kaliningrad” that stopped in Latvia in their 1400 km long running course. Tatiana Krasnosumova, leader of the UPF St.Petersburg, introduced the UPF activity within the Baltic Dialogue to all participants. She inspired all to foster sincere and friendly relations between the Baltic nations and Russia in the spirit of mutual respect and cooperation. During the round table discussion, 30 participants representing the grassroots diplomacy shared ideas about solving difficult situations and building peaceful relationships with the means of sports, art, cooperation etc. New guests, university students, attended this special meeting. Dr. Kreslins, a military general and professor at the Latvian Military Academy, attended this meeting and was very positive about our movement. He shared about his family that has both Russian and Latvian roots having always lived beyond national differences. Afterwards Dr.Makoto Ando, President of the UPF Latvia, and FWPU national leader in Latvia, explained the meaning of “Peace Bridge’, quoting the UPF founder Dr. Sun Myung Moon: “Forgive, Love, and Unite.” Latvian, Lithuanian, and Russian participants drew lots to find their international partners. In the Ceremony of Forgiveness and Unity, participants shared their personal information to continue their friendship. Participants were very much inspired by international character of the event and the general joyful atmosphere.